While many modern day bikes have started offering high-tech laser cut keys, there are many bikes which still come with old Key-in-Knob (KIK) type keys. Such keys can be highly unreliable and here is a video that shows two brand new Royal Enfield bikes demonstrating the same. 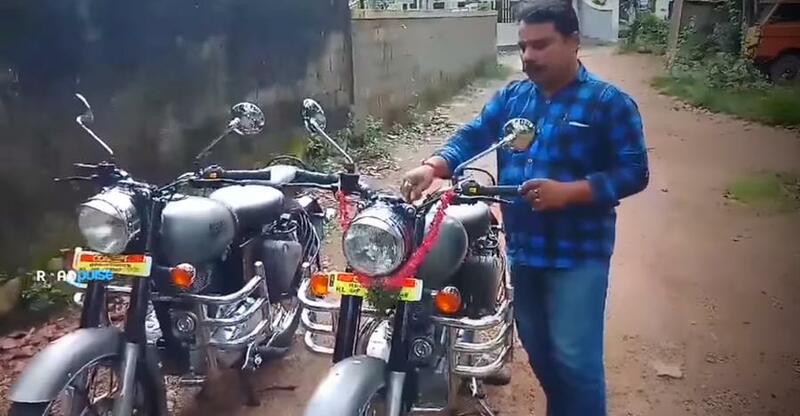 The video shows two brand new Royal Enfield Classic bikes parked side by side and a person holding a key. The person in the video first puts the key on one bike and starts it. He then takes out the key and puts it in the other Royal Enfield parked on the side. Interestingly, the key works and the second bike starts too! While such things are quite common when the locks become old and continuous wear and tear makes the edges flat, it is uncommon in brand new bikes. Over regular use, the grooves in the lock lose their edges and it can be literally opened by any key that fits in the groove. In some extreme cases, the lock can be opened by inserting any hard metal object inside the lock and rotating it. Keys and locks are made in various combinations and it is possible that a single key can open two different locks. However, lock manufacturers ensure that similarly made keys and locks are shipped to different regions to avoid any such thing. It is not known if both the locks have the same key combination or one of the locks have malfunctioned. It is always better to use a secondary lock in automobiles. Be it a car or a bike, a secondary locking system ensures that the vehicle is safe and adds one extra layer of security. For bikes, there are many secondary lock mechanisms available, like a disc lock, which locks the brake and the bike becomes unmovable. Also, the wheel locks are quite effective and do not allow the bike to move when the handle lock fails. At present, there are many sophisticated devices like GPS-based locks, that can tell you the real-time location of the bike if it gets stolen and can even turn off the bike.